Komarin’s visual vocabulary is intuitive and subconscious: its basis draws from objects which are close at hand. Household items – cups, bowls, wooden spoons, become fodder for formal abstraction on the canvas. These include Vessels for transporting fluids of all kinds and Cakes – both architectural and domestic. Komarin’s Duke and Wigmore paintings reference two roads that intersect near the Royal Academy in London. Landscape oriented, they refer to no particular landscape but suggest roads and rivers coming together, crossing, and moving on in a new direction. They deal with issues of chaos and control, much like nature itself. 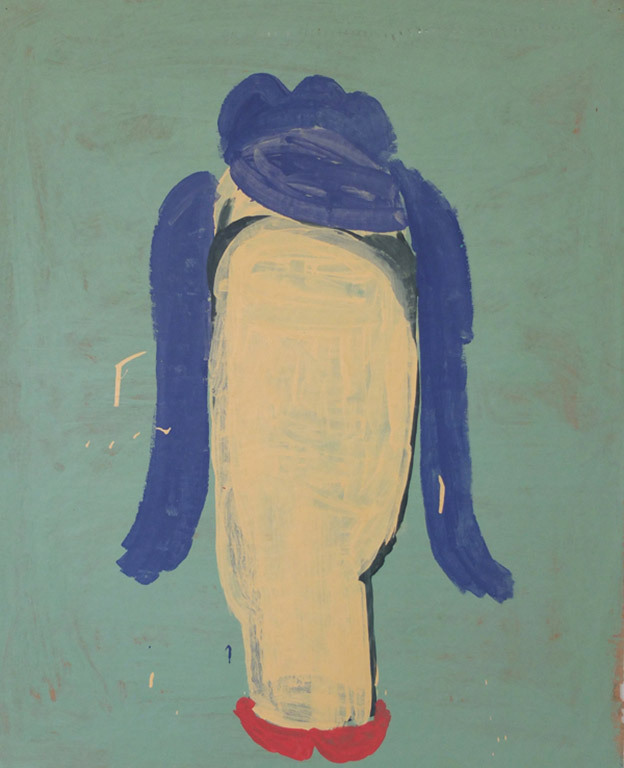 Komarin’s paintings from The French Wig are playful and delight in the myriad ways that faces and wigs can allude to images that exist outside this specific domain. For Komarin, what is seen and what is hidden become players in the dialogue at hand. A contour of a form may speak to that form but also speaks to the space around that form. The paintings that work the best are those that leave the door open to interpretation, to the mind’s best and most natural ability to wonder.